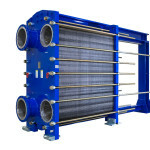 In simplest terms, the answer to your question “What is a Heat Exchanger?” is that it is a device used to transfer heat between one or more fluids for the purpose of cooling. The fluids might be separated by a solid dividing wall to prevent mixing or the fluids might come in direct contact with each other. Heat exchangers are commonly used in many industries within a variety of environments for cooling and heating large scale industrial processes such as marine transport, food manufacturing, breweries, dairy, data center cooling, oil and gas refineries, paper and pulp, space heating, refrigeration, air conditioning, power generation, chemical plants, pharmaceuticals, petrochemical plants, petroleum refineries, natural-gas processing, sewage treatment and many more. 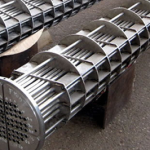 Shell and Tube Heat Exchangers consist of series of metal tubes. One set of tubes contains the fluid that must be either heated or cooled. The second set of tubes contain fluid that runs over the tubes that are being heated or cooled so that it can either provide the heat or absorb the heat. A set of tubes is called a ‘tube bundle’. Plate Heat Exchangers are composed of many thin, slightly separated, corrugated metal plates that have very large surface areas and small fluid flow passages for heat transfer. Plate Heat Exchangers are commonly used in low to medium pressure fluids applications, compared to the medium and high pressure applications in which Shell and Tube Heat Exchangers are used. Advancements in gasket technology and brazing technology have made Plate Heat Exchangers more practical and economical for a wider variety of applications. In HVAC applications, large Plate Heat Exchangers are called Plate-and-Frame. Over time heat exchangers become ‘fouled’ or clogged with debris, contaminants, mineralization, scale, and chemical deposits which cause the Heat Exchanger to become less efficient. For this reason MechPro Inc. recommends a proactive approach for mission critical systems which includes contracted, pre-scheduled periodic maintenance and testing by MechPro trained Heat Exchanger Technicians. Typically Plate and Frame Heat Exchangers can be disassembled for cleaning whereas Shell and Tube Heat Exchangers are cleaned by methods which may require acid cleaning, sandblasting, use of a high-pressure water jet, bullet cleaning, or drill rods. Contact MechPro Inc., the Nationwide 24/7 Emergency Heat Exchanger Service with any questions, concerns and service issues.